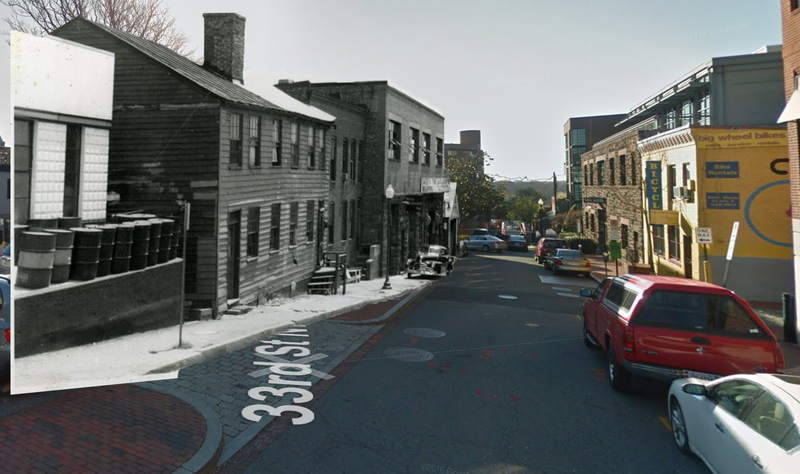 Now and a Long Time Ago: Lower 33rd St. This week for Now and a Long Time Ago, GM returns with another photo from the great Wymer archive at the DC Historical Society. 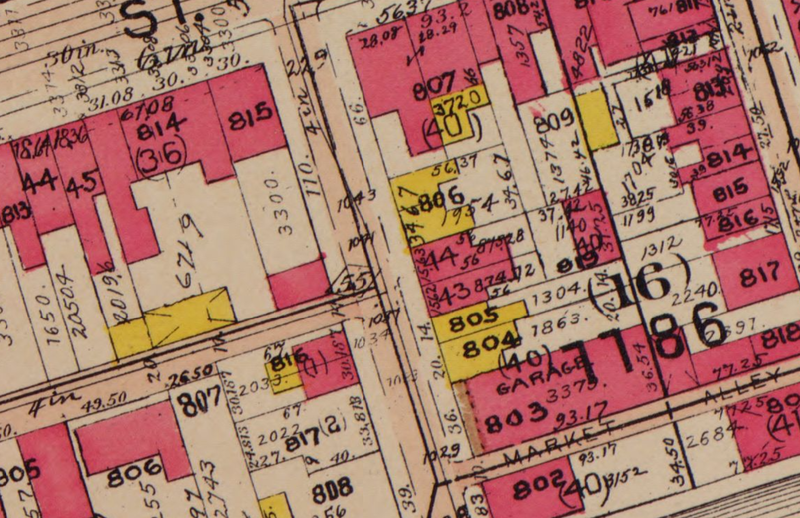 Today, it’s of the 1000 block of 33rd St., just below M St.
Yellow buildings on this map are wood frame buildings. So the yellow buildings under the 806 are the wood frame buildings in the photo. Given the lack of signs, they appear to be homes. The next two buildings in the picture appear to correlate to the pink buildings in the map (pink means brick or stone). The next building in the photo appears to be the same building that exists there today. But it doesn’t seem to be consistent with the map, which suggests two more narrow wood frame buildings and then a brick or stone garage. And that makes sense since the building that’s there now was built in 1932. The last gable front brick building at the bottom of the street also appears to be the same as the one that is there now. It was apparently built in 1906. Unfortunately it’s too blurry to make out what sign is on the larger building. For what it’s worth, ads suggest that that address was used the National Brewing Company until at least 1938, which is probably right before the photo was taken. The National Brewing Company was the large Baltimore-based brewery responsible for National Bohemian (i.e. “Natty Bo”), so it’s likely that this was just a distribution location, not an actual brewery itself. I currently work in the buildings labeled 802 and 803. 802 was an auto repair shop for a while; an older man who either used to own it or work here came by a few years ago and gave us some nice pictures of what it looked like as an auto repair shop. The rumor is that the parts of these 2 buildings that are made of stone (easily seen in person vs the parts made of brick) were taken from the old aqueduct bridge when it was dismantled (it used to carry the canal across the potomac from georgetown to rosslyn). You can still see a few of the pilings for that bridge near the VA side of the key bridge, as well as the old abutment on the georgtown side. Yes, a canal that crossed a river, but that’s a story for another day.